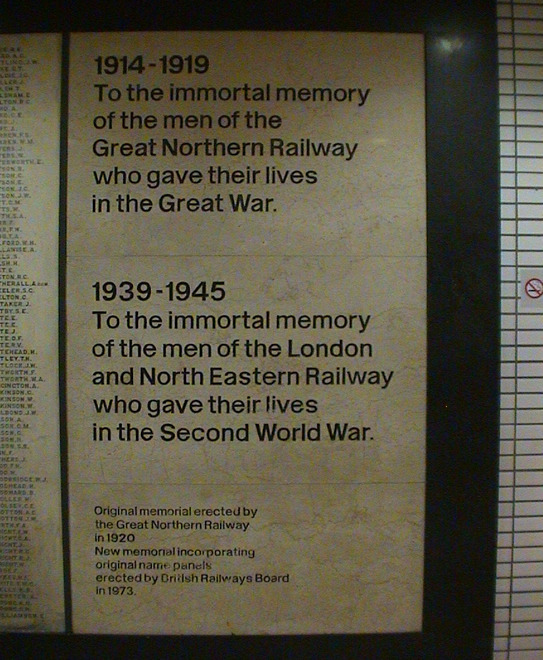 To the immortal memory of the men of the Great Northern Railway who gave their lives in the Great War. To the immortal memory of the men of the London and North Eastern Railway who gave their lives in the Second World War. Original memorial erected by the Great Northern Railway in 1920. New memorial incorporating original name panels erected by British Railways Board in 1973. There are 937 names, listed alphabetically (with a few out of sequence) in 11 columns. These names were in the original WW1 memorial which you can see here; the addition for WW2 did not include a list of names. On transcribing the names from our photographs we realised that the Cs and the Gs are often indistinguishable. Normally we would go back and check each one but the memorial has been temporarily removed so we must wait until it returns before we can do that. In the meantime please be aware of this as a cause of inaccuracies. This memorial was in the south west area of the station concourse. The original memorial, erected in 1920, and extended after WW2, was replaced in 1973 and not a single decorative element remains, leaving the memorial looking very utilitarian. Actually the memorial is not in situ anymore. Shortly after we took the photographs (January 2008) it was dismantled and put into storage while the station is renovated. We inquired and were promised that it will return, and not end up in the British Railway war memorial graveyard in Acton. Further news. Cross on the west facade of the church.